El Capitan, the 10.11 release of OS X has been out for a few days now. If you haven't seen all the features from all the tech blogs already, Apple has set up its own microsite dedicated to showing off all the new things you can expect to find. El Capitan is available as a free download from the App Store. So if you don't have it, go get it. My upgrade took about 30 mins, it did get stuck after the first restart, but powering down my laptop and turning it back on resumed the install without any other issues. There are a bunch of cool new features in El Capitan, however one stands out so much that it makes the whole upgrade worthwhile, for just that one addition. I'm of course talking about the shake-to-locate mouse pointer feature that enlarges your mouse cursor when you 'shake' the mouse. To me, this is a must have. Many a time I tend to lose the mouse pointer on my screen. This leads to frustrating thrashing of the mouse. It gets even worse when you're doing a lot of work on the Terminal or with text documents. Well no more. This feature is enabled by default. There is a way to disable it though. 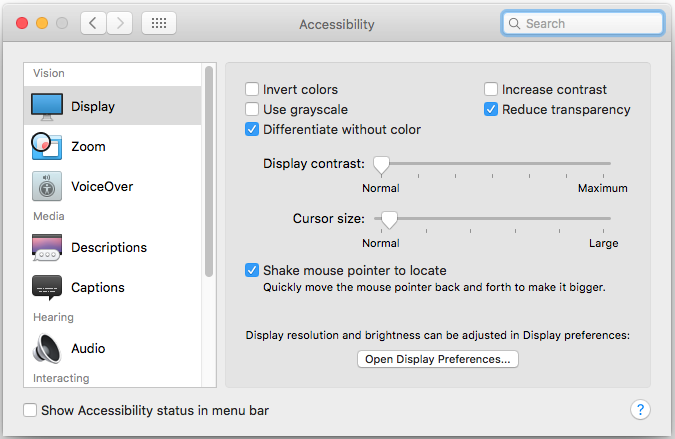 You find the setting in System Preferences > Accessibility > Display. It's official setting is Shake mouse pointer to locate. Here it is in action. Excuse the quality of the video, Quicktime doesn't seem to record the enlarge animation when doing a screen recording so I had to use a standard camera to capture this. All you have to do is rapidly move your mouse from side to side to make the pointer 'shake' and it will momentarily grow in size. If you do this when you have the i-beam pointer (the one used for selecting text), the enlarged pointer is the standard arrow too. Enjoy not losing your mouse pointer ever again!